Inspired by "Green Grow the Lilacs" by Lynn Riggs. Played on Broadway 2245 performances. A young woman, Laurey, lives in the Oklahoma Territory in the early 1900's. She is in love with a cowboy named Curly. He loves her to, but so does the "bad guy" a hired hand named Jud. Tension builds between Curly and Jud until tragedy strikes. 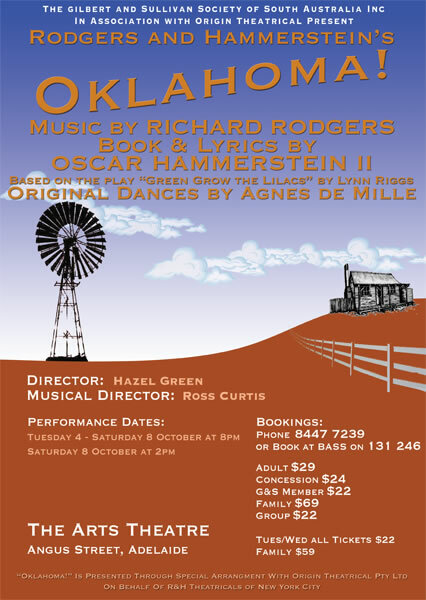 Gilbert and Sullivan Society's first performance of "Oklahoma!"